ANTONIO MECCA was born in Italy on November 26, 1873. The son of an itinerant fruit dealer, he had come to America in 1888. 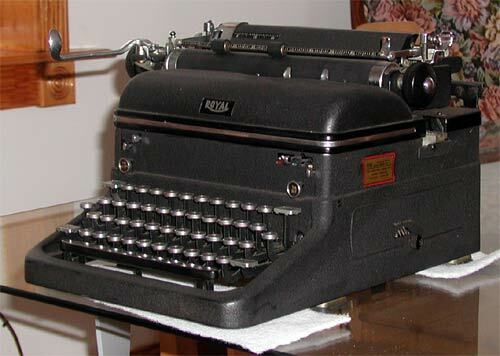 Antonio Mecca arrived in Camden in 1890 after picking berries in nearby Hammonton for a year, , and married his wife Isabella Gargano around 1894. Antonio Mecca began in business by selling fruit from a pushcart in Camden, and by 1902 owned a liquor store. 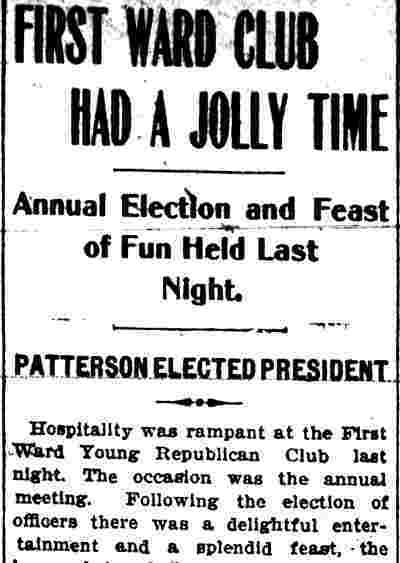 In 1906 he opened a funeral business at South 4th and Division Streets. 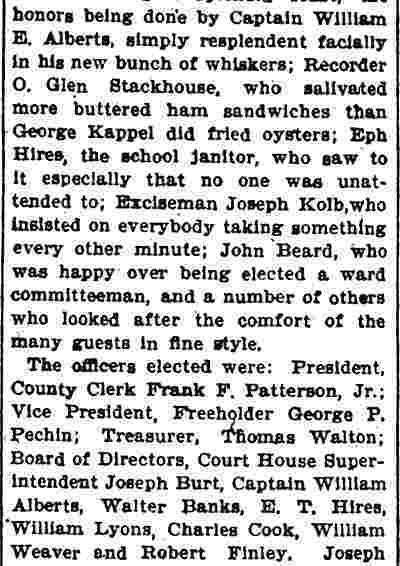 He was an organizer of the Camden Italian American Building Association, serving as president beginning in 1907. 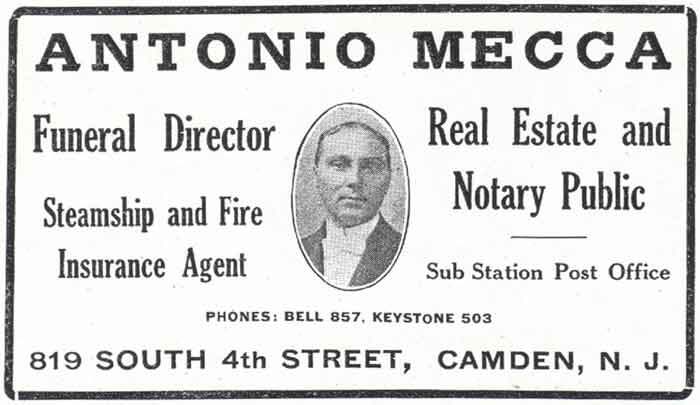 Besides the funeral parlor and the Building Association, Antonio Mecca was involved in real estate and fire insurance. He arranged steamship tickets to and from Europe, was a notary public, and ran a substation of the Camden Post Office from the building he had erected in 1908, which due both to its appearance and its importance to the Italian-American community came to be known as "The White House". 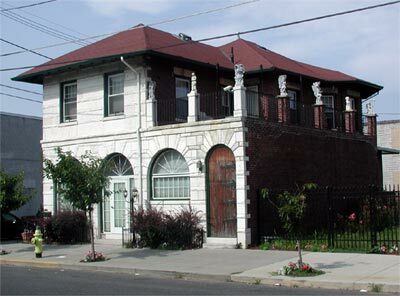 The White House, at 819 South 4th Street, is a two story building designed in the style of a Mediterranean Villa. It was and still is situated in close proximity to two Roman Catholic churches, Our Lady of Mt. Carmel Church, 832 South 4th Street, and the church of St. Peter and St. Paul at Spruce and St. John Streets, just east of Broadway, and from these two churches Antonio Mecca initially drew much of his clientele. As his reputation grew and the Italian-American community spread throughout Camden, his business grew also. From the White House, Antonio Mecca became a navigator for those many immigrants who spoke no English. The post office sub-station he ran was to assist residents in sending money to family back in Italy. Besides his duties as a notary public, when needed, he interpreted for fellow Italians in Camden courts, helped neighbors get citizenship papers and waived fees for funerals if families did not have sufficient funds. "Tony Mec" as he was known in the neighborhood, also instituted a pre-paid funeral plan for working class families at fifty cents a week. He also operated a limousine rental service. The 1910 Census shows that Antonio Mecca, his wife Isabella, and his widowed mother Angiolina were living at 819 South 4th Street. Antonio and Isabella Mecca became American citizens in 1913. Mr. and Mrs. 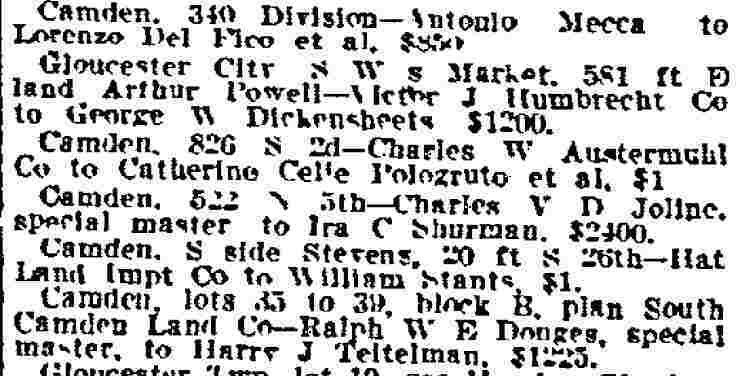 Mecca remained at 819 South 4th Street through the 1930 Census, and Antonia Mecca appears in the 1947 Camden City Directory. In 1919, Antonio Mecca, along with Joseph LaMaina, and Frank Viggiano founded the First Italian Building & Loan Association. 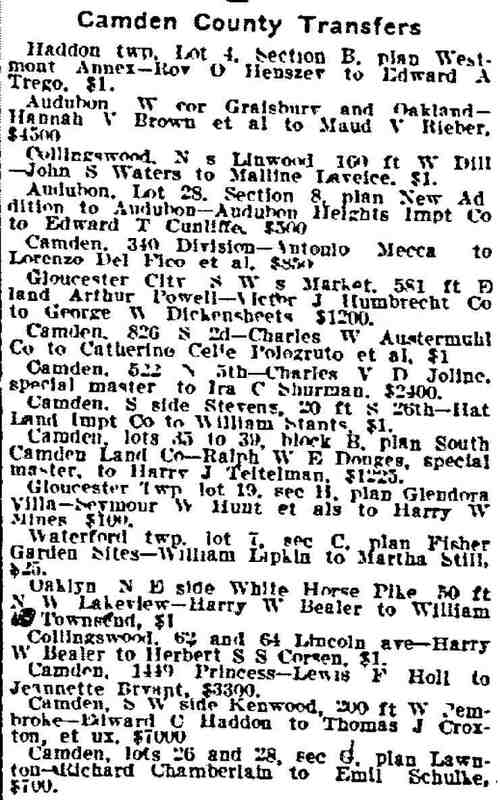 The Mecca's next door neighbors from the 1910s through the 1940s were his relatives, the Fiore Troncone family. Fiore Troncone served for many years as a Detective with the Camden Police Department. 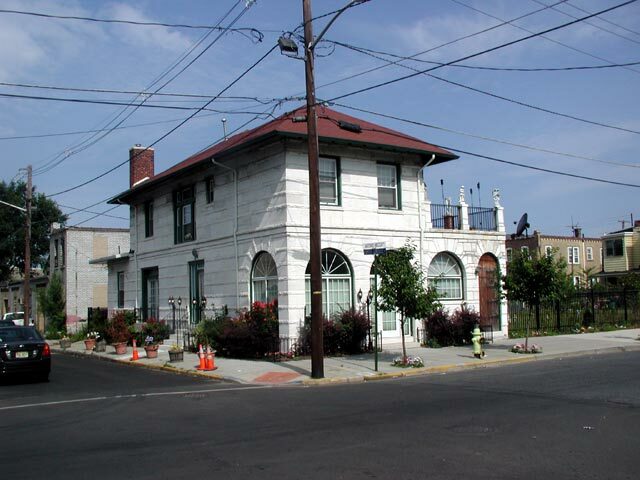 Other neighbors included the Lario family on Pine Street, sons Frank M. Lario Sr. and Anthony M. Lario would become prominent Attorneys in Camden. 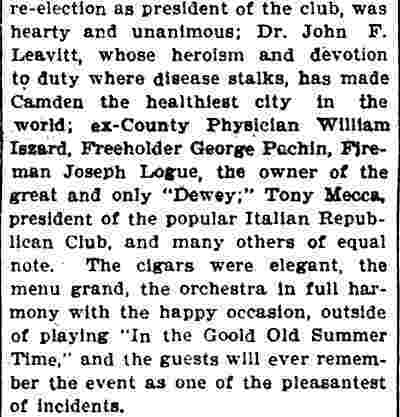 Involved with many civic organizations, Antonio Mecca was also a member of the Camden Chiselers Club, which was organized in 1930 and included many members of Camden's political and business community. 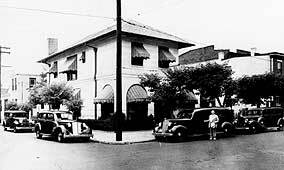 Antonio Mecca was still living and in the funeral business at 819 South 4th Street as late as 1947. He passed away in 1952. 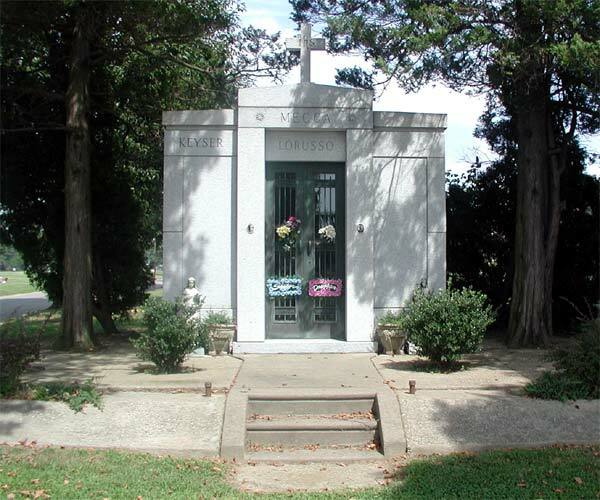 819 South 4th Street was operated by long-time employee Richard Troncone as the Troncone Funeral Home for a few years after his death. Antonio and Isabella Mecca rest at Calvary Cemetery in what is now Cherry Hill NJ. The White House at 819 South 4th Street still stands today. As the neighborhood changed, the building had deteriorated, and by the early 1990s it was totally unusable. Due to the efforts of Sal Scuderi the building was restored. In May of 2001, it opened again to the delight of some hundred current and past residents who turned out for its dedication. ANTONIO MECCA, widely known and respected throughout Camden, and especially in the Italian section of the city where his business interests have been located for years, is a man who wholly by his own efforts and energy has won his way and found goals of success. One of the leading undertakers in the city and very well known in New Jersey for his painstaking methods and the personal kindly interest he takes in the practice of his profession, Mr. Mecca has exemplified through a life of continuous activity and usefulness the great value of the quality of perseverance. His courage and his talents have been the means of bringing him to the fore in business, political and social matters: and as one of the results of his indomitable good nature and his deep interest in the social progress of the people of his own nationality, he fraternizes generously with many associations, and holds office in many. The story of his career is that of one who has toiled hard and with merited success for the results attained. 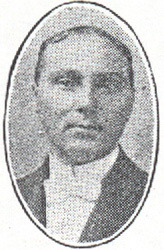 He is a son of Vitio Mecca, who was engaged in the grocery business, and who died July 16, 1896, and of Angelina Marie (Rinelde) Mecca, who makes her home with her son. Antonio Mecca was born November 26, 1873, in Italy, and though he attended the schools of his native place, the facilities were poor, and early in life he went to work on his father's farm, prior to his removal to the United States. He well recalls the brave efforts he made to establish himself here and to make a living: In 1888-1889, for example, he took the first Job that was offered him, and he spent his time profitably in picking berries in Hammonton, and then he went to Camden to try to make his way into more promising business. As a result he worked in a Federal Street fruit store one year, after which he bought a pushcart, and sold merchandise on the streets. Thereby, he was enabled to earn enough money to open an oyster saloon on Market Street, in 1891, turning that into a liquor saloon after the first year, and he so continued, and in the same location, until 1905. It was while engaged in the saloon business that he found many opportunities for association with real estate and fire insurance matters; and he accepted such opportunities. And it was at this time that he made his first start in the undertaking business, serving an apprenticeship of five years with George Taylor, of Camden, a prominent funeral director, and that apprenticeship being served while Mr. Mecca was able to give spare time from other work. He was therefore able to take out his undertaker's and embalmer's license in December, 1906, and he started his funeral directing establishment at No. 330 Spruce Street. 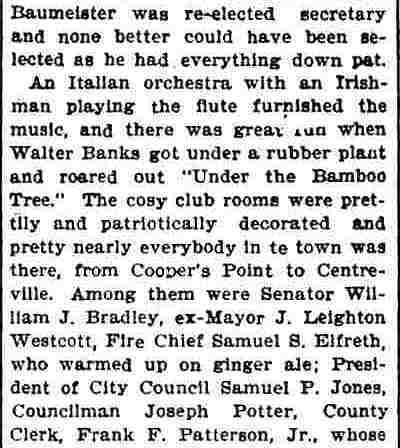 With the requirements for the increase of his varied interests, and particularly those attending the modernizing of his undertaking business, he built his residence and office at Division and Fourth streets in 1908, and began to occupy the premises in 1909. Since that date, also, he has had charge of a sub-post office at his residence and office, and he also is a notary public. Mr. Mecca disposed of his saloon in 1905, and gives all of his attention to his present business. He was made vice-president of the Victory Trust Company, of Camden, December 1, 1923. 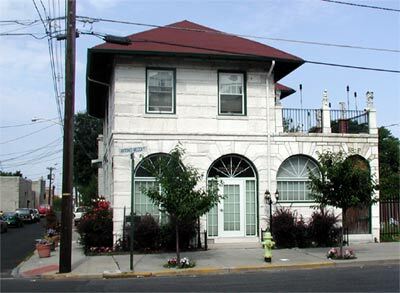 Since 1907 he has been president of the Camden Italian Building and Loan Association; and he is a member of the board of directors of the Italian and American Building and Loan Association, of which he was one of the organizers. He was court interpreter in the Camden criminal court for six years, 1900-1906; and by appointment of Judge Lyon of the Municipal Court he was interpreter for that court from 1906 to 1912. Mr. Mecca has many fraternal interests, and he is well-esteemed and popular in all. He is a member of the Improved Order of Red Men; has been president of the Italian Republican League since its organization; member of the Italian Beneficial Association of Philadelphia, the Italian Beneficial Columbus Society; and a member of at least ten other Italian societies. His business interests also prominently associate him with the National and State Associations of Funeral Directors. He is a communicant of the Our Lady of Mt. Carmel Roman Catholic Church. Mr. 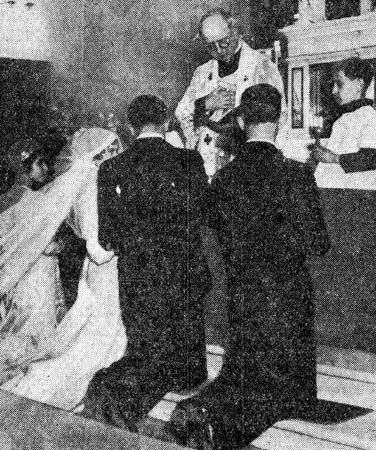 Mecca married, September 22, 1892, at the Italian Roman Catholic Church in Philadelphia, Isabella Gargano, a daughter of John Batisto Gargano, who died January 18, 1914, and of Teresa (Penelle) Gargano. 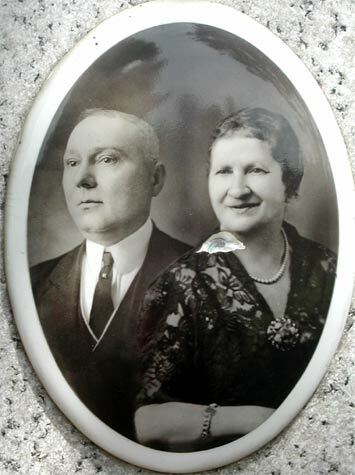 Mr. and Mrs. Gargano came to the United States from Italy in 1888, settling in Philadelphia. They were the parents of ten children. Four Republican groups will join in staging their thirty-seventh annual ball and fair March 17 at the headquarters of the First Italian Republican League, 813 South Fourth Street. 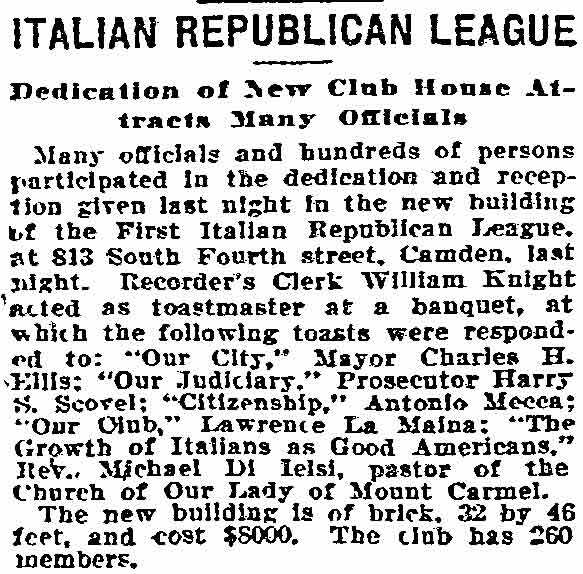 The units under whose auspices the program will be presented include the league, the Fifth Ward unit of the Young Republicans of Camden County, the Camden County Women's Italian Republican Club, and the Young Ladies' Italian Republican Club. The committee in charge includes Antonio Mecca, former coroner, chairman; Mrs. Mamie Piraine, vice chairman; Richard Troncone, secretary, and Vincent Sarubbi, treasurer. The two-story building at the far left is where Antonio Mecca did his embalming. The garage building to the left of the two-story building is where he kept his hearse and limousines.